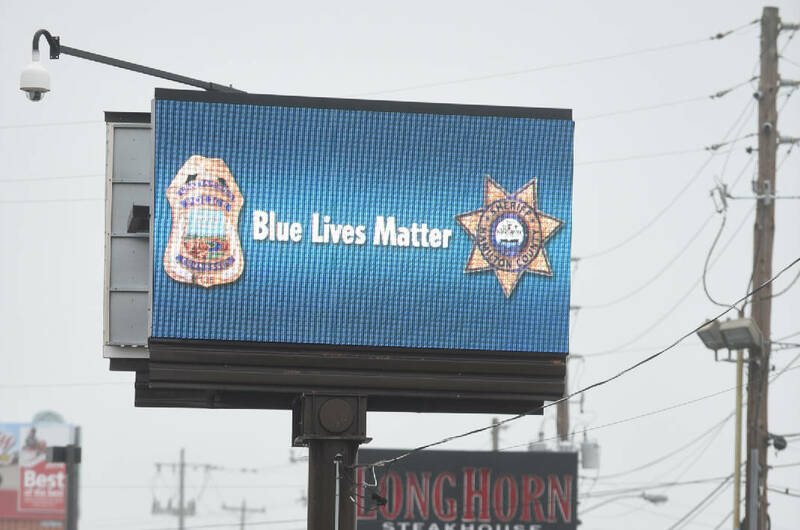 A "Blue Lives Matter" ad is shown on Brainerd Road. 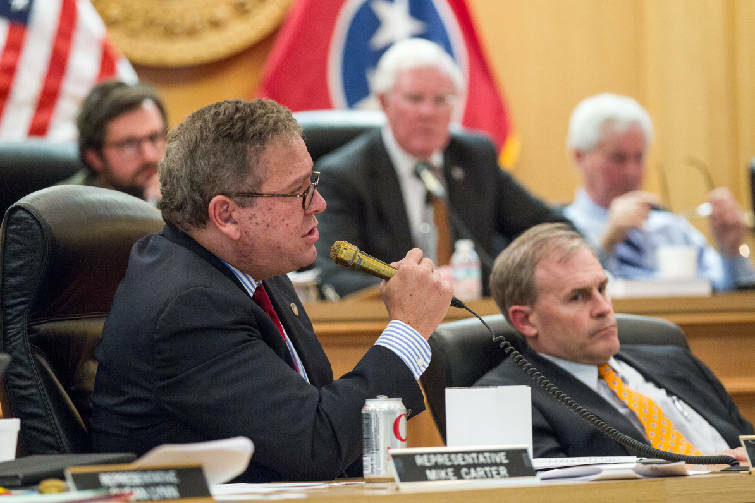 NASHVILLE - State House Majority Leader Gerald McCormick and Sen. Todd Gardenhire joined with four fellow GOP lawmakers on Monday to announce they will push a three-bill package of "Blue Lives Matter" measures they say is aimed at boosting protections for Tennessee law enforcement. "Almost exactly a year ago we had an incident in Chattanooga where a terrorist actually attacked a couple of military installations," said McCormick at a Legislative Plaza news conference, referring to Mohammad Youssef Abdulazeez's bloody July 16, 2016, shooting rampage in which he gunned down five U.S. Marine and Navy reservists. Abdulazeez, whom the FBI later said was "inspired" by terrorist groups' propoganda, died in a hail of gunfire when confronted by Chattanooga police after he emerged from the Navy Reserve Training Center on Amnicola Highway. Introducing Chattanooga Police Officer Kyle Moses, McCormick said the training officer "is one of those who ran toward the sound of gunfire" that day "and did what needed to be done ,which was to take out the terrorist who was taking out innocent Americans. This is the reason that we're doing this today." 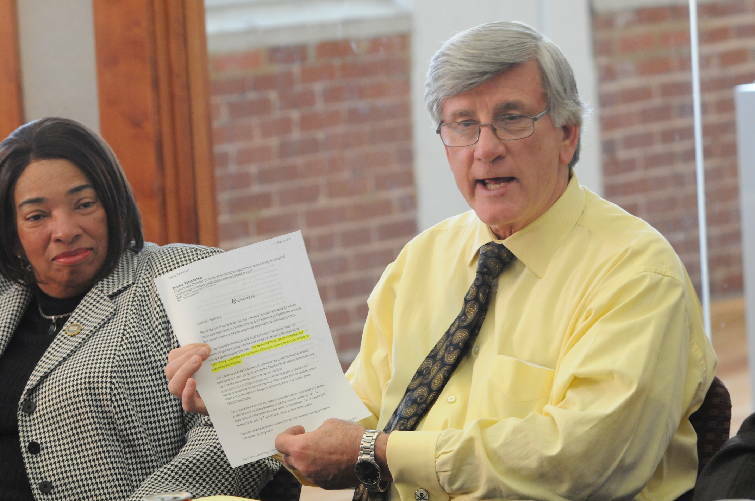 McCormick and Gardenhire, who are both Chattanooga Republicans, have a bill that would automatically elevate Class A and Class B misdemeanor simply assault charges on a police office to a Class E felony carrying up to six years imprisonment and up to $15,000 in fines upon conviction if the defendant "knew or should have known the person assaulted was a law enforcement officer." "This is something we really need to do because there's no way that somebody can say, 'Well, I just didn't know he was a law enforcement officer even though he has a blue uniform on, or a state trooper's uniform on or a sheriff's officer uniform on," Gardenhire said. "Because this is something that's inexcusable." Training Officer Moses later said he appreciated the legislation, saying he had been "flabbergasted" to learn that when an officer is assaulted that it wasn't a felony. "The fact that it is now elevated to the level of a felony, to me, that's one of the most important parts of it. I've never been shot but I've been shot at multiple times," Moses said. "I've had guns pulled on me multiple times, I've had knives pulled on me countless times. I've been in fist fights, several of them for my life, I've felt like." Sen. Mark Green, R-Clarksville, said that "all across American right now men and women in law enforcement are being targeted simply because of the uniform they wear. For most of us, it's incompehensible." Green said "we all see these men and women, our law enforcement officers, as keepers of the peace. Like our military, they keep us free. And an assault on them is an assault on freedom." The "Blue Lives Matter" slogan emerged after black activists took up the call of "Black Lives Matter" following a spate of police shootings. "Let me be first very clear," Green said. "Our naming this effort Blue Lives Matter is not intended to detract from any other movements with similar names. We recognize that injustice happens to many different groups of people in many forms and it is not our intention to lose focus on those efforts." But Green, who noted seven police officers were shot with one of them dying in a recent 72-hour period in the U.S., added "our law enforcement is being targeted. And the title Blue Lives Matter communicates our purpose very clearly. We aim to pass laws that protect the men and women who are sworn to protect us." Green and Rep. Mark White, R-Memphis, have a second bill that designates as a "hate crime" the killing or attempted killing of someone because they are a law enforcement officer or perceived to be one. It would classified as a Class A felony with the presumptive sentence awarded "at the maximum of the range permitted," Green said, which can mean the death penalty. Sen. Mike Bell, R-Riceville, and Rep. Andy Holt, R-Dresden, have legislation they say is intended to protect home addresses of law enforcement officers from becoming public. It would be a misdemeanor carrying a crime of $500 for "accidental publication" of such information and $2,000 if intentional without the permission of the law enforcement officer. Asked whether that would apply to someone in law enforcement who had been charged or convicted of a crime, Green said other provisions of state law allowing judges to release such information when they rule it appropriate would supercede the directive. Chattanooga Officer Moses said he sees the package not so much about himself but for his wife, son and parents. Last July, Moses said, there were a number of Chattanooga police officers who responded last July to Abdulazeez's attack on Amnicola Highway. "We all ran to the gunfire," he said. "It really stuck in my mind that there's a time when the Marines and sailors are fighting for me and protecting me. It's my time to do what I can to protect them. At that moment in time, the training and instinct took over and I responded with brothers and sisters in blue and we took care of the problem."